So, most of you probably know the saying…“One apple a day will keep the doctor away!” Now I can change that to “One mango a day will keep the doctor away!” Keep reading and you’ll find out why. There are many health and nutritional benefits from eating mangoes. I eat at least one a day with my smoothies, fruit salad or even as a simple dessert! Mangos are very popular here in Costa Rica (how can it not be?!) and also known has the “the peach of the tropics”. A true comfort food… Mangos are revered not only for their exotic sweetness and juicy quality, they are also known for their many health blessings. They contain an enzyme similar to papain in papayas, a soothing digestive aid. Mangos also contain a lot of tryptophan, the precursor of the “happiness-hormone” serotonin. These comforting enzymes can be held mostly responsible for that feeling of contentment we experience during and after our daily mango enjoyment. These proteolytic enzymes that break down proteins are effective meat tenderizers (Check out my recipe!) regularly used in tropical countries where mangos are grown. The enzyme list continues with magneferin, catechol oxidase, and lactase that not only protect the mango from insects, but it can help us by stimulating metabolism and purifying the intestinal tract. The fruit, leaves, bark and root of mangos and mango trees are being used in alternative medicine to treat many ailments… read more here and here. Studies have shown that foods containing phenolic compounds have powerful antioxidant, anticancer and anticardiovascular abilities. Mangos contain phenols quercetin, isoquercitfin, astragalin, fisetin, gallic acid, and methylgallat. In India mangoes are used as blood builders. Because of their high iron content they are suggested for treatment of anemia and are beneficial to women during pregnancy and menstruation. People who suffer from muscle cramps, stress, and heart problems can benefit from the high potassium and magnesium content that also helps those with acidosis. Doing my research on mangos, I found this claim from different websites: “One lab test turned up rather amazing results that raised mangoes to the “highest perch”. Mango juice was poured into a test tube that contained viruses. Shortly, the viruses were destroyed.” I googled all over, but I wasn’t able to fully confirm that. So, If you know where the report is for that lab test or able to confirm that it is true… please let me know! Knowing what I know now about mangos… it is deliciously natural to crave those mangos! One medium mango, which is about 10 1/2 oz., is a very impressive, self-contained package of vitamins, minerals and anti-oxidants that only packs 135 calories. Like most fruits, the mango is low in protein, about 1 gram for a medium size, but you can totally benefit from its 3.7 grams of fiber. Being of the plant kingdom, mangos contain only about .6 grams of total fat. Their sodium content ranks low at 4 mg.
Mango is at the top in the beta carotene realm, summing up at 8061 IU for that same medium size. If you’re looking for a boost in potassium, look no further than a medium mango with its 322.92 mg. It is the perfect fruit to replenish energy after heavy physical exercise like jogging or working out. The magnesium content is 18.63 mg with traces of manganese, selenium, sodium and phosphorus. Mango scores 57.3 mg of vitamin C and offers impressive numbers for vitamins B1, B2, B3, and B6. There’s even a touch of zinc in the fruit with calcium at 20.7 mg. and iron at .27 mg. The mango, mangifera indica, means “the great fruit bearer”. Interestingly, this savory exotic fruit belongs to a large group of trees and shrubs called anacardiaceae, which include the cashews, pistachios, poison ivy and poison sumac! That’s why some people get “mango rash” if they eat raw mangoes that are not properly peeled or washed. I had my first “mango rash” a couple weeks ago (I was at a breakfast buffet) because the mangoes weren’t properly peeled or washed. A rash broke out on my lips… it itched and burned like crazy! Learned my lesson and hope that won’t happen again. I know some people are highly allergic and can’t even touch the mango skin or leaves without breaking out. Sometimes the mango has been described as a combination of a peach, pineapple and apricot. Whatever you believe the taste to be, eating the velvety and fresh juicy mango is an unforgettable experience. It is said that there are over 1,000 varieties of mangos throughout the world. Wow! How can that be? A native of Southwest Asia, the mango has been cultivated and praised since ancient times. The Persians are said to have brought the fruit to East Africa in the 10th century. In the 16th century, the mango was introduced to Brazil and the West Indies… and the rest is history! Mangos normally reach maturity 4-5 months after flowering. The yield usually varies with the age of the tree. At 10-20 years, a good crop may be 200 or more fruits per tree. Washing the fruit after harvest is not only important to remove poisons, but it will prevent leaking sap from burning the skin and making black lesions, which leads to rotting. To choose a good mango, make sure is has a floral scent and it should give slightly to the touch if it is ripe. Mangoes lend their tangy sweet flesh to many inventive dishes, especially in Indian and Southeast Asian cuisine. During times of famine in India, even the mango seed was eaten after lengthy boiling. In India mangoes are dried, ground into a powder, and used in amchur, a condiment similar to chutney. 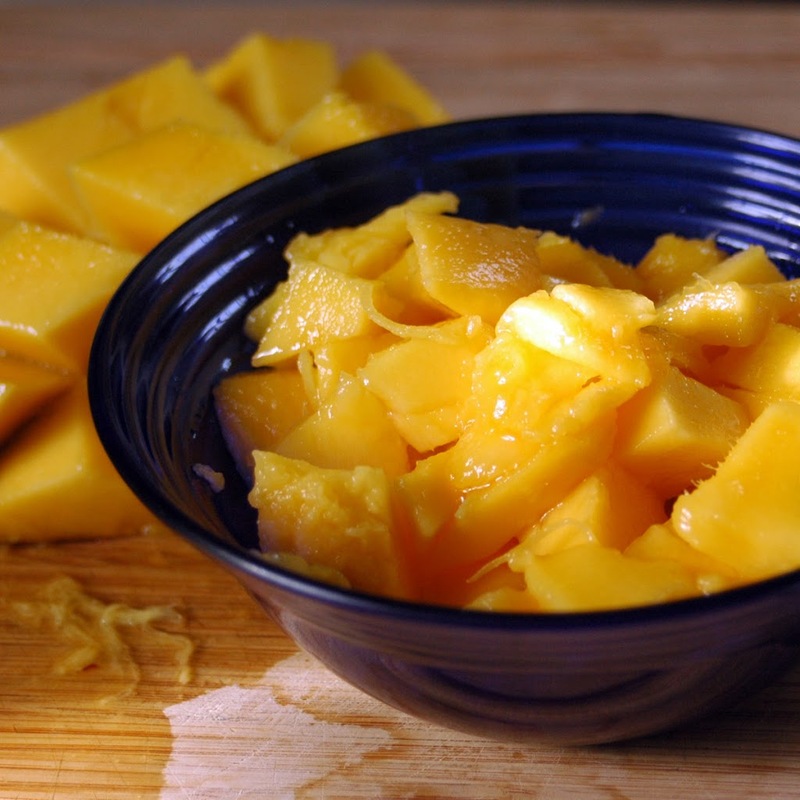 Jamaicans also dry their mangoes to make a spicy condiment similar to chutney. India may have been the original inventor of sweet and chewy fruit leathers, which, centuries ago, they began making from ripe mangos. They’re also noted for their mango pickle that can be quite fiery hot and spicy. Indian restaurants today typically feature a beverage called Lassi made with mango, yogurt, sugar, ice and a touch of ground cardamom. Mango chutney, an Indian condiment made from green mango, brown sugar, vinegar, hot peppers, and ginger is probably the most well known dish that employs the mango. In their unripe form, mangos are just as appealing as when fully ripe. Throughout Southeast Asia, green mango salads are common and take on a variety of seasonings that incorporate lime juice, chiles, and rice vinegar. In the Philippines, unripe mangos are enjoyed as a between-meal snack sprinkled with salt or dipped into soy sauce. In Guadalupe, a city in the central region of Mexico, mangos are chopped, salted and sprinkled with a little oil and served as a refreshing appetizer. In America, smoothies are becoming increasingly popular and mangos are in the Top Ten Favorite Fruits list. 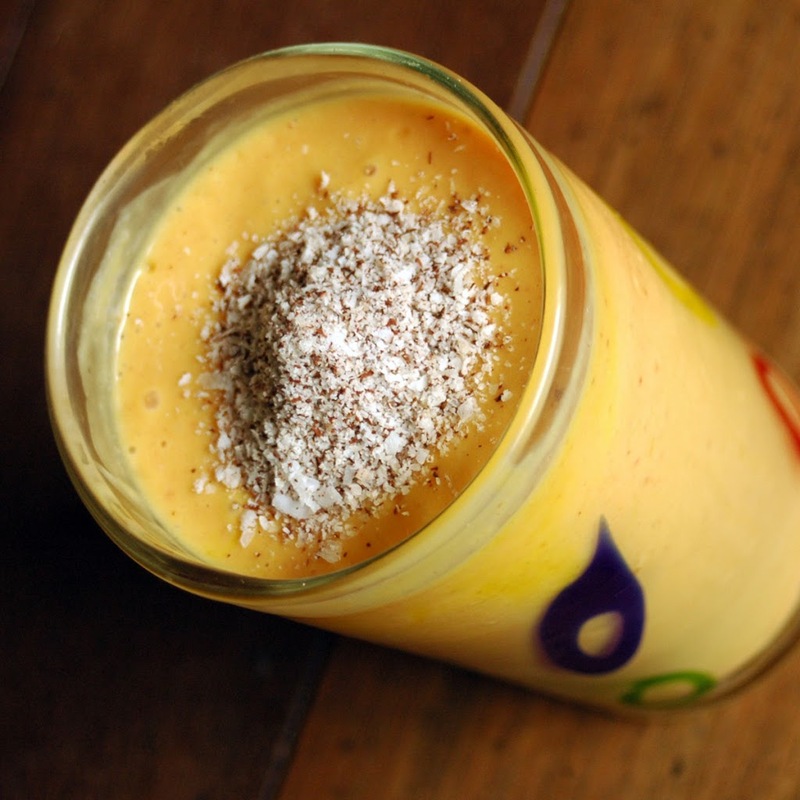 My favorite combination is mango, strawberries, banana, honey, egg yolk, coconut oil and coconut flakes (picture above). Here in Costa Rica, everybody loves to eat ripe mangos as it is or in smoothies (with water or milk). With green mangos, they sprinkle lime and salt for a quick, refreshing snack. There are many ways to enjoy your mango. You can simply peel back the skin and eat the entire mango like a banana. It’s rather a messy adventure and mango juice can leave a permanent stain on clothes, so have lots of napkins and towels on hand. Mangos can be sliced, diced, and julienned into fruit salads. They also make a fun, tangy addition to tossed green salads. Pureed in the blender, mangoes add delectable sweetness to smoothies and creamy sauces over fruit salads. Enjoy fresh mango salsa with diced mango, onions, tomatoes, garlic, cilantro, lime juice, sea salt, and sweet or hot peppers. Try diced mangos on your oatmeal and use them as a dramatic garnish over grain or legume dishes. Sorbets are a refreshing way to incorporate mangos into your summer menus. Mangos are also delicious served over grilled chicken or fish. I’ve made a roast with mangos and was thrilled with how yummy it was. 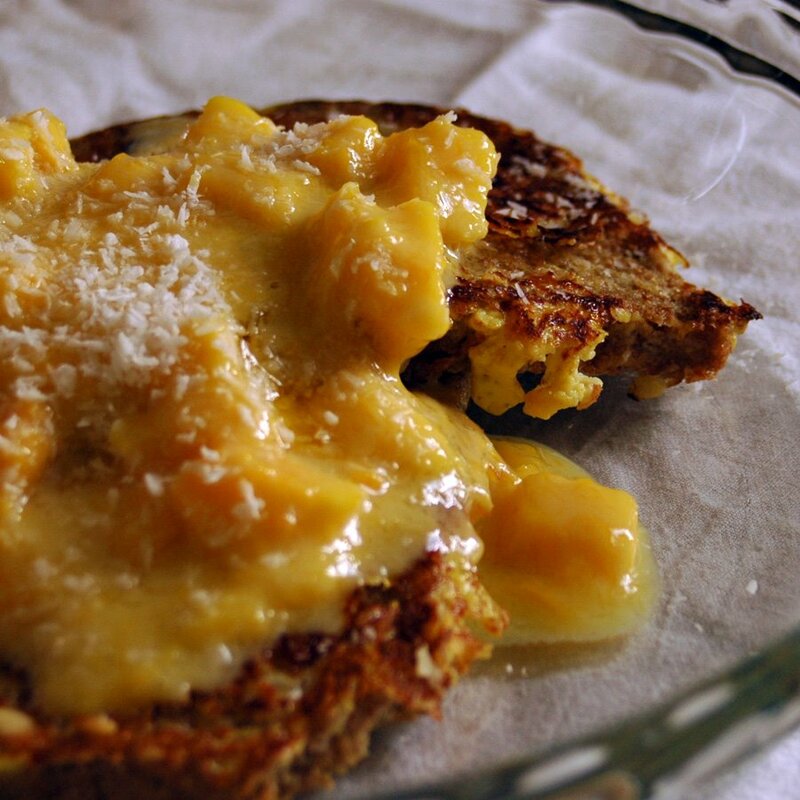 Also, try my Coconut French Toast w/ Honey Mango Sauce (picture above). It is our special Saturday morning breakfast and delicious! It is often a struggle to remove the seed from the mango. The flesh does not leave the large central pit very well. It is best to cut on either side of the mango pit. This is the popular way to cut up your mangoes. Its almost like cutting an avocado, pretty easy. A few gals ask me to demonstrate on video how I cut a mango. So, I had my mom film me with our cool flip camera, but I am having trouble uploading the video! I gave up… but you can google “how to cut a mango” and you’ll get good videos. Enjoy your peach of the tropics! Great information on mangos! Cutting one can be an adventure, so I’m glad to hear there are some videos out there that I can watch.